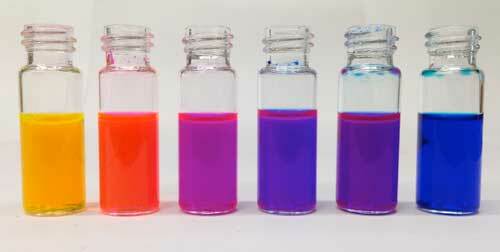 (Nanowerk News) With a new technique to craft a spectrum of glowing dyes, chemists are no longer chasing rainbows. Swapping out specific chemical building blocks in fluorescent molecules called rhodamines can generate nearly any color scientists desire - ROYGBIV and beyond, researchers report in the journal Nature Methods ("A general method to fine-tune fluorophores for live-cell and in vivo imaging"). Until about 20 years ago, scientists relied on chemical fluorescent dyes to make biological molecules visible. For peeking inside cells, staining organelles, and other imaging experiments, "chemistry was king," Lavis wrote in a July 13, 2017 perspective in the journal Biochemistry ("Chemistry Is Dead. Long Live Chemistry!"). And then, the king was kicked off the throne -- by a glowing green jellyfish protein called GFP. In 1994, scientists reported the use of a genetic trick to tack GFP, the green fluorescent protein, onto other cellular proteins; it's like forcing the proteins to hold a glow stick. That trick gave researchers a simpler way to trace proteins' movements under a microscope - without using expensive synthetic dyes. The innovation blazed through the field of biological imaging. In 2007, scientists' mixing of GFP and two other fluorescent proteins let them paint mouse neurons a parade of vivid colors in a technique known as the "Brainbow." A year later, the discovery and development of GFP earned the Nobel Prize in chemistry for three scientists, including the late Roger Tsien, an HHMI investigator. So researchers turned back to chemistry. Scientists had developed cutting-edge microscopes and new techniques to label cellular contents, Lavis says, but the dyes for marking molecules inside cells were still stuck in the nineteenth century. His team focused on rhodamines, because they're especially bright and cell-permeable - so they easily slip into cells and make them glow. But despite working with rhodamines for more than 100 years, chemists had created only a few dozen colors, and most were similar shades ranging from green to orange. Until recently, making new rhodamines wasn't easy. Scientists still used techniques from the earliest days of chemistry, boiling chemical ingredients in sulfuric acid. This forces the molecules to link together in what's called a condensation reaction. Mixing in different building blocks can yield new and unusual dyes. But ingredients had to be tough enough to survive the boiling acid bath - which didn't leave a lot of options. This kinder, gentler approach opened the door to a wide new world of dyes, and Lavis's team dove in. Four years later, they revealed the Janelia Fluor dyes, fluorescent molecules up to 50 times brighter than other dyes, and more stable too. The secret behind the Janelia Fluor dyes is a tiny square-shaped appendage called an azetidine ring - a structure made possible only by Lavis's new chemistry approach. Scientists can use a variety of strategies to get the bright dye molecules onto the protein they want to study. Then, they can zero in on the lit-up protein, and watch it wiggle around and interact with other molecules - without the usual background fuzziness. "For us, it was a total revolution in the field of single-molecule imaging," says molecular biologist Xavier Darzacq of the University of California, Berkeley. Before using the Janelia Fluor dyes, the fluorescent-tagged transcription factor proteins his team studied were too dim to capture in crisp images. Researchers had to hold the camera shutter open for 10 milliseconds to collect enough light. That's long enough for proteins to wander, so the image would come out blurry - like a photograph of a squirmy toddler. But the Janelia dyes are bright enough that his team can capture molecules in action in just a millisecond, Darzacq says. Such quick snapshots have allowed his team to do lab experiments he describes as "simply unthinkable a few years ago." Now, Lavis's group has figured out how to fine-tune their fluorescent dyes, by tweaking rhodamines' structure even further. Rhodamines have a basic four-ringed design with groups of atoms protruding from different parts of the rings. In previous work, the scientists developed strategies for coarse tuning dyes - snip out an entire appendage here, and you can make a green dye. Pop in a silicon atom there, and you've got red. Lavis discovered that by carefully placing just a few new atoms in the dye structure, the color and chemical properties of the dyes could also be fine-tuned, allowing many shades of green from a single scaffold. It's like going from the classic eight pack of crayons to the jumbo box of 64. In a separate paper, published August 9, 2017 in the journal ACS Central Science ("General Synthetic Method for Si-Fluoresceins and Si-Rhodamines"), the team described a way to modify the dye structure's bottom ring. The dyes are synthesized in a single step with inexpensive ingredients, Lavis says. That makes the dyes cheaper than commercial alternatives - pennies per vial. The low cost has allowed his team share their work with scientists around the world. 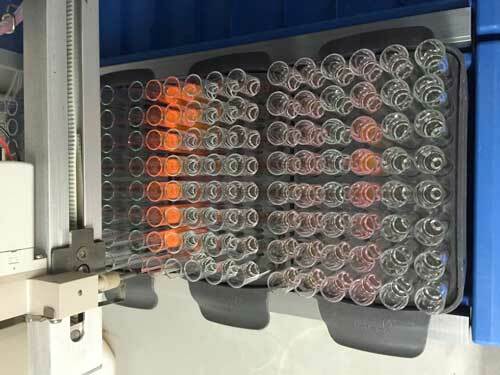 Lavis, Grimm, and colleagues have now shipped thousands of vials to hundreds of different labs.